This statistic shows the most allergy friendly small restaurant chains in the United States in 2017. Burtons Grill was the most accommodating to guests with food allergies out of the small restaurant chains, with a rating of 4.83. 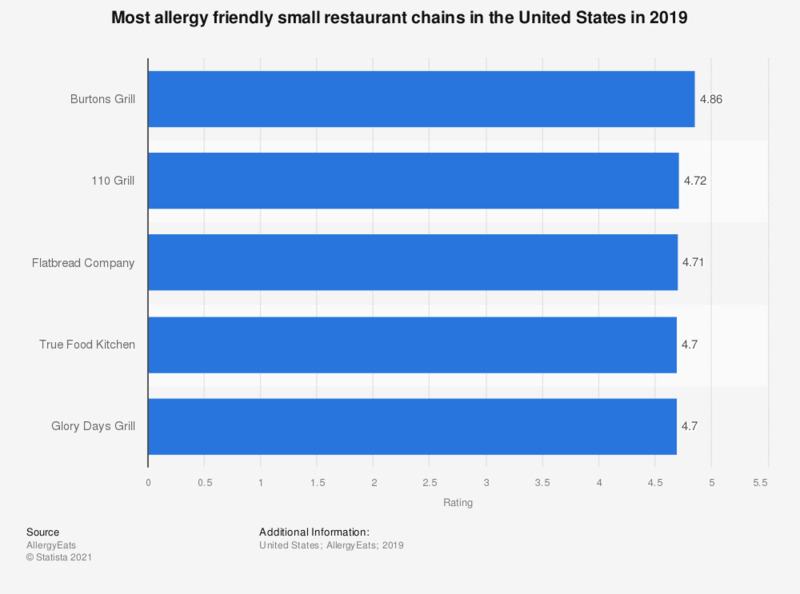 Ratings are based on how well restaurants accommodated guests with food allergies and come from reviews left on the AllergyEats website or app which lists over 650,000 restaurants across the United States. Restaurant chains were divided into three categories: large (over 50 units) and small (under 50 units). Ratings are based on a 1 through 5 scale, with 5 being the most allergy-friendly.